I often get asked how I protect my indoor lamps, accessories and furniture from the rain on my screen porch. These are the tricks that I use. Can I share a secret with you? Everything that I use on my screen porch isn’t weatherproof. 😲 I have furniture, a lamp and other accessories on my porch that aren’t made for the outdoors. I’ve come up with a few tricks over the years to protect those items from the elements, so let me share them with you. 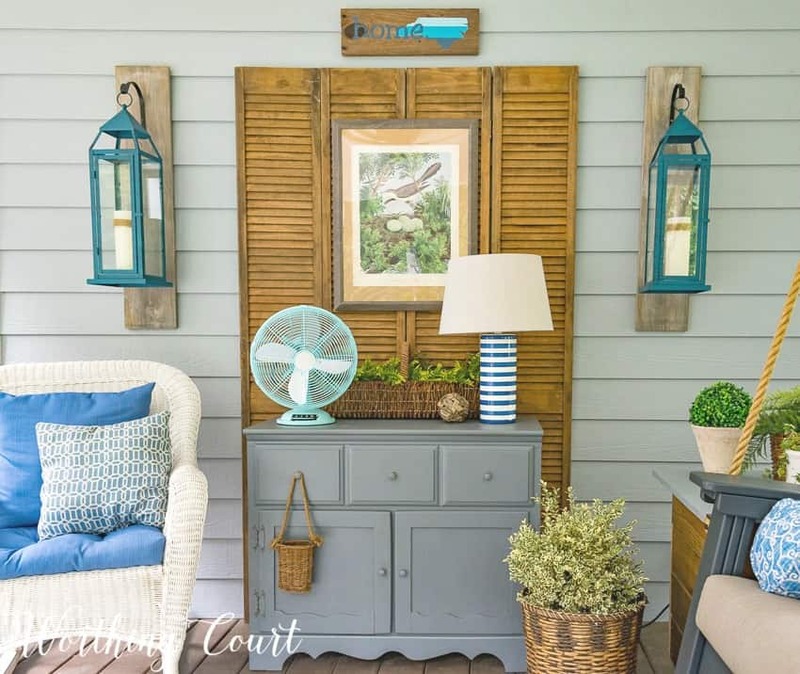 EXTERIOR PAINT/STAIN: I would never place a piece of indoor furniture outdoors unless it was either painted or stained first with exterior paint or stain. Depending upon the furniture, I might also seal it with exterior polyurethane. When painting furniture for outdoors, I paint the areas that are visible, such as the top, front and sides, as well as the unseen parts, like the bottom and back. It’s very humid where I live, so painting every single side helps to protect the entire piece from moisture. Depending upon the situation, I might opt to paint the interior of drawers and cabinets too. 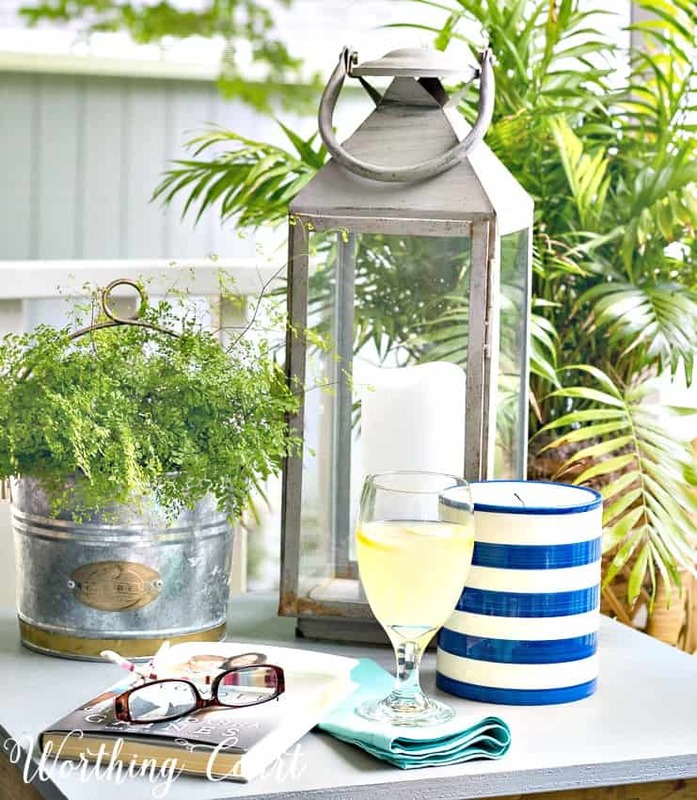 PLACEMENT: I’m very careful with the placement of any outdoor pieces that I use. I make sure to place those items in a location that doesn’t get direct rain or sun. The small chest on my screen porch is actually the bottom half of an old dining room buffet. To protect it from the elements, I located it against the back wall of the porch, where rain doesn’t get to it (unless we’re having tropical storm force winds). It’s painted with two coats of Sherwin Williams Duration Exterior Latex in Network Gray and is also sealed with exterior polyurethane in a matte finish. I adore the ambiance of a lamp when sitting on our porch in the evening or at night. 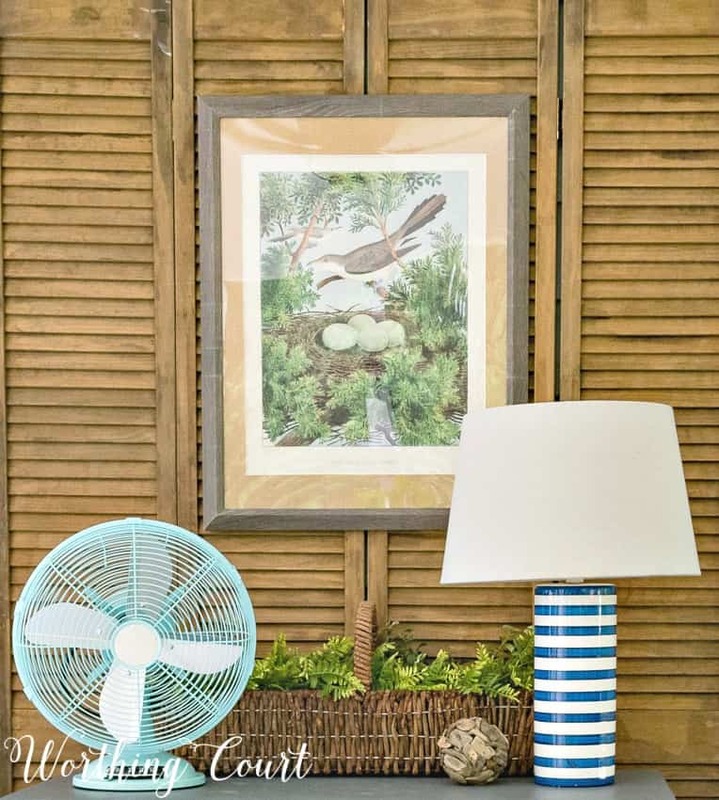 There actually are lamps available that are made specifically to be used outdoors, but I’ve always found them to be a bit pricey and I enjoy changing my decor up too often to make a large monetary commitment like that. To protect any lamps that I do use outside, it actually comes down to placement once again. The lamp that I currently have on our porch is sitting on a chest against the back wall and doesn’t get any direct moisture on it. I admit that I was a little concerned about how it would react in a damp environment, in the event of an especially humid or rainy day, but so far it has done great. 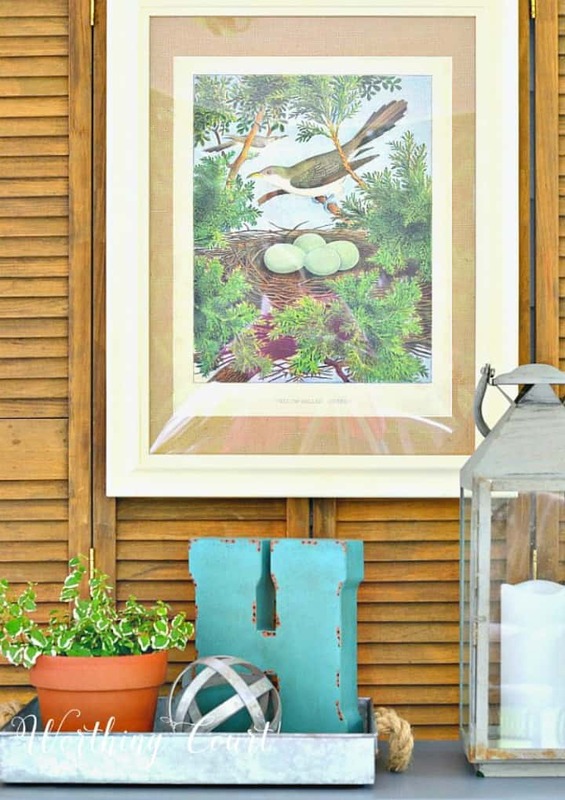 When using framed art prints on my porch, my biggest concern is wrinkly paper. Wrinkly paper you ask? Well…try leaving a piece of paper lying out in a humid environment and see what happens to it – it gets all wrinkly, even if it doesn’t come into direct contact with moisture. My solution for this problem was to take my print to my local office supply store and have it laminated. They basically seal the print between the laminating material which totally protects it. If you don’t want to pay someone to do this process for you, there are self-laminating supplies that can be purchased online. Once the print has been laminated and the frame has been painted with exterior paint, frame and hang the artwork as you normally would. I’ve used this same method on artwork hanging on a wall on a deck, where it got full exposure to the weather and had no problems at all. Protecting accessories is easy to do by spraying them with outdoor-safe spray sealer. I almost always use a matte finish, instead of gloss as the matte doesn’t look so obvious that you’ve sprayed the item with sealant – it looks like it was purchased that way. I make it a point to always buy outdoor-safe cushions for any furniture pieces that live outdoors, but I do love throw pillows, so I have quite a few of those that are meant to be indoors only. There’s an easy solution for protecting those as well and that’s to spray them with outdoor Scotchguard™. I typically use the heavy duty variety and give the pillow several coats. If you have more tips of your own for protecting your furniture, fabrics and accessories from the elements, please share in the comments! So glad you added this information for all your followers! 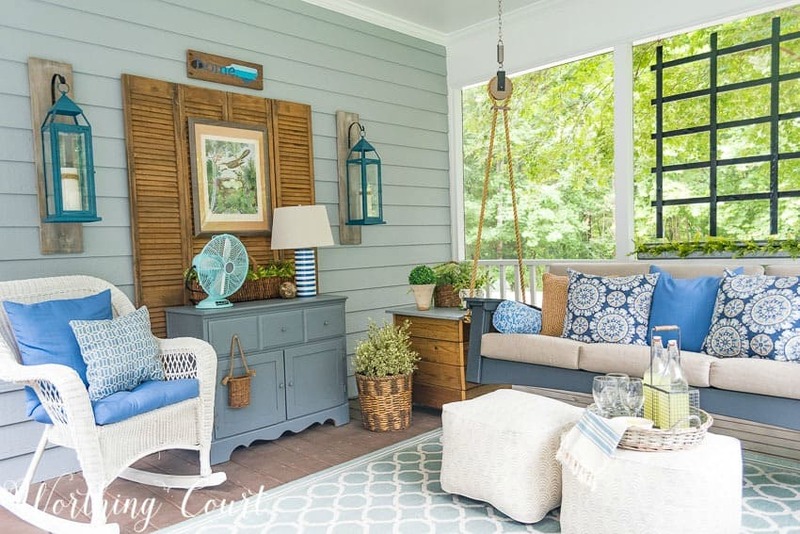 So many great tips for porches that are open to questionable weather elements! Thanks, Pamela. Hope you found something helpful! Thanks for all the info. Some of it I have done before, but you gave me some really good ideas! Have a wonderful day!! So happy you found some new ideas, Deb! Glad you found some ideas, Kate! There is a spray on product called Wet and Forget that I spray on my outdoor rugs and drapes that keeps mold and algae from forming. It’s humid here in Virginia too and I find Wet and Forget to help protect almost any surface! Thank you for the wet and forget product. 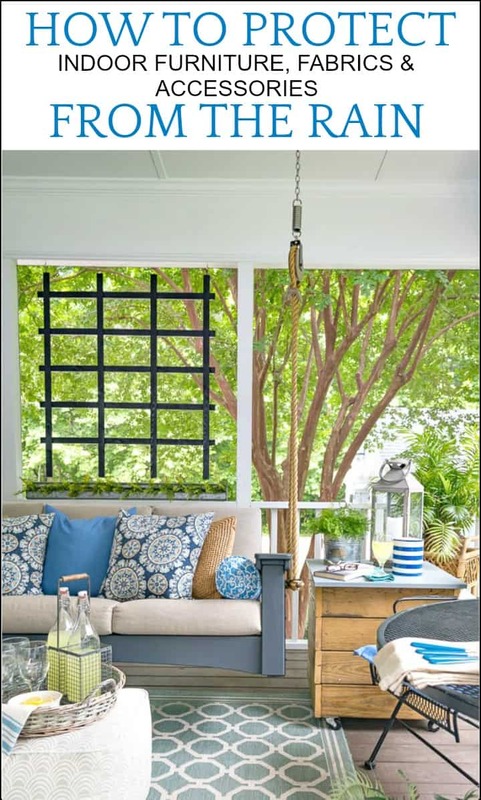 I will be moving into a house with a screened porch and plan on some outdoor curtains. Living in Arkansas we also deal with heat and humidity. Hoping this product will take care of a potential mildew problem. Thank you for the recommendation! I have’t heard of that product before, so I’ll have to try it out. Thank you so much, Julie! It’s been a looong time coming, but I finally have a brand logo and blog design that I’m happy with. I especially love the artwork tip. Thanks! And that fan……so stinking cute. Where on earth did you get it? Thanks for the tips, Suzy! You’re so welcome, Marilyn. Hope you found them helpful. In this area of the world, we don’t have porches. And I’m always a bit jealous when I see them . Maybe someday I will have one! In the meanwhile, I enjoy your photo’s 😉 . Thank you and I hope that you get the porch of your dreams one day! What about the rug, how do you protect it? Hi Linda. The rug is an indoor/outdoor rug, so I don’t need to do anything to it. I wouldn’t recommend using an indoor only rug outside, unless you know for a fact that it can’t/won’t get wet. Excellent article ! I am in Arizona and don’t have the sometimes constant rain that the south gets (formerly from AR), but what I do get are the monsoons! Add to it the fine desert sand and the haboobs! Everything gets coated in a fine sand and or dust…. Drives me crazy! Then 3rdly the blazing sun can make things fade super fast. I have 2 patios one up front and the other in the back.. Both have pergola roofs but the back one has half pergola half covered.. It’s always challenging trying to figure out how to protect things.. So thank you so much for a great article! Oh wow – you have quite the challenges that I don’t have to deal with! I have a covered patio, but rain still blows in from the sides. This spring I purchased covers for my chairs and sofa from coverstore.com (about $160 for 3). I had looked for a year locally and on line. These covers completely cover, are heavy duty, and have a “breathing strip” on the front. I love them! They come in a variety of sizes and also have a drawstring at the bottom. Thanks for letting us know about those covers, Janis. That sounds like a good price based on what I’ve seen before! Hi Pam. 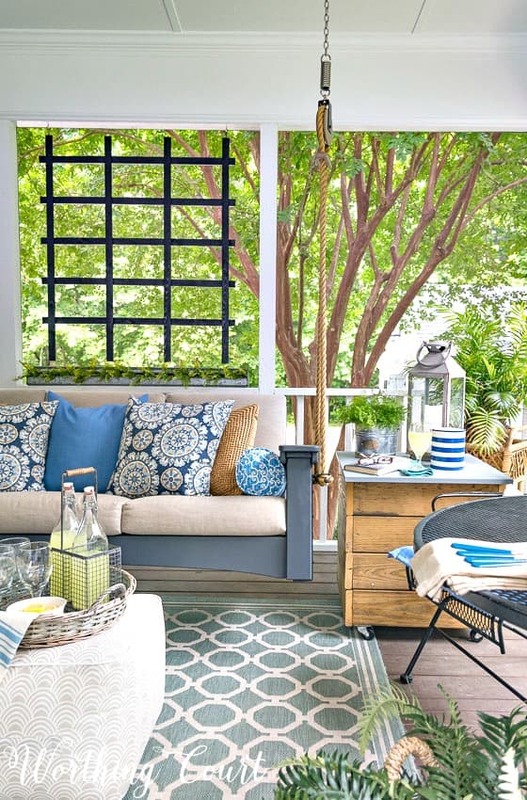 I buy most of my outdoor cushions at At Home, but I’ve also bought some at Walmart, HomeGoods and Target. I enjoyed reading your article you have some great tips. I am in VA and in the process of adding a screen porch and want to use two rattan swivel chairs that were originally purchased for indoor use. I am thinking about sealing with exterior polyurethane and using Scotchguard™ on the cushions. What do you think? Also, what did you do to protect the matting on the picture? Hi Bonnie. You probably already know that rattan furniture is meant to be weather resistant, but it isn’t meant to get wet, so I think it’s definitely a good idea to seal your chairs with exterior poly. If your cushions aren’t covered with outdoor fabric, then I would seal those too. Someone else, here in the comments, mentioned that she has been very satisfied with a product called Wet and Forget. I don’t have any experience with that product though. The mat on the picture isn’t protected with anything. I guess it’s far enough away from any moisture that it hasn’t been a problem. Hope it stays that way!